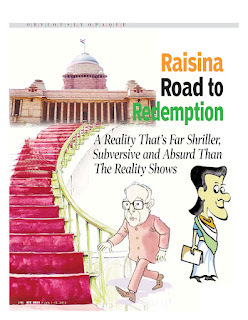 <b>Raisina Road to Redemption</b> :Reality that’s far Shriller, Subversive and Absurd than the Reality Shows! 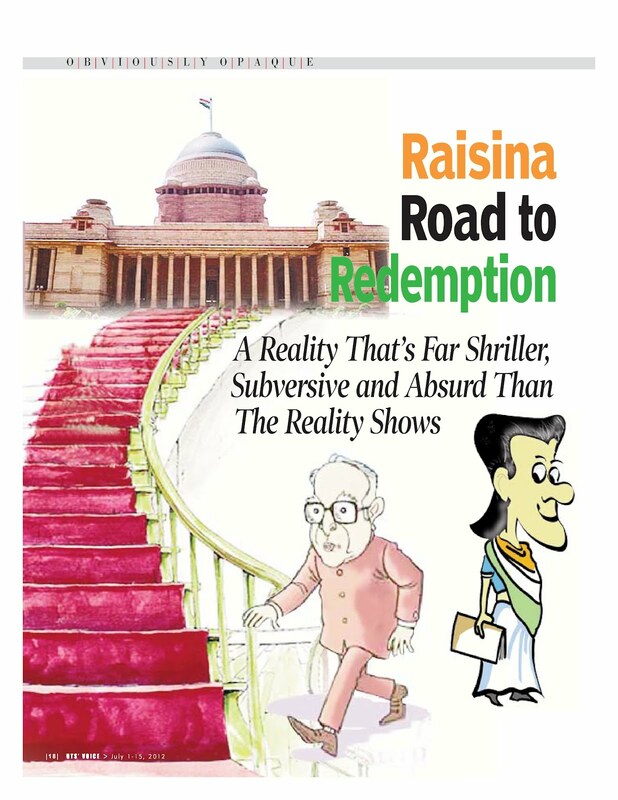 Raisina Road to Redemption :Reality that’s far Shriller, Subversive and Absurd than the Reality Shows! It has them all. A Dolly Bindra with all her shrillness intact. A Rahul Mahajan with faked gentleness oozing out of his sheer existence. A Shakti Kapoor with the aura of a reformed sinner. And a myriad other minnows. Minnows who seem to be nothing more than literary devices, and serve no purpose other than bringing out the best, and the worst, of the protagonists. Protagonists! Aah that reminds me of the Big Boss calling the shots from behind the curtain. What a script this could be. No reality show worth its salt had ever had such an explosive mix of such cacophonous characters capable enough to pack even an Arnab Goswami (Nation be upon him) off to oblivion. What a service would that have been to our nation is beside the point! I know that the doubting Thomases would be turning in their graves to assault me with the data on over all television ownership, viewership, share of English channels in this overall viewership and what not. All I have to tell them is go, get some life folks! How the hell can one not watching Arnab’s (NBUH) show every night even claim to belong to this nation? That is seditious. Arnab’s (NBUH) shrieks embody and articulate the conscience of the nation. His questions are never his; they are the questions that haunt every Indian. His truths are not his either. They are the truths, the decisive proof against Einstein’s theory of relativity. Who, then, are these people who do not watch his Newshour and yet have the guts to masquerade themselves as being Indian? The truth, the Arnabian truth to be precise, is that they do not exist, not in the national conscience at least. Well, forgive me for getting a little carried away, but then that’s quite natural. Mention Arnab (NBUH) and no patriotic Indian can stop himself from getting carried away. And here is a script that could have sent off even Arnab Goswami (NBUH) to oblivion! Let me explain why before anyone even shoots that dreaded question off his mouth. It could have for it is no ordinary reality show designed to satiate the voyeuristic middle class of the country. It is no other reality show with participants out to win this or that money, a dance show, a chance to sing in Bollywood or even a husband or wife! This is the script for nothing less than the Presidential Elections in a country that loves to fake itself as the biggest functioning democracy of the world! The fact that the Hindi term for president has a ‘pati’ or husband in it is, again, beside the point. Interestingly, the ‘pati’ thing is not the only one reality show quotient in this potboiler of a script. It has many more gems to make it qualify for the genre beginning with the name itself. Think of naming the show as ‘The race to Raisina Hills’ and ask yourself if one could invent a catchier name! Race part would take care of adventure, Raisina of romance and the hills; they would take care of both! In fact, they would do more than that by bringing in the endurance part. Which reality show, at least in India has it all? Alas, this one being real and not a reality show is such a loss for television but for Arnab Goswami (NBUH) and his diehard ‘citizen’ audience. Perhaps this is the time to shout action. And here it begins. A rabblerousing fighter woman is on a mission. Well, I concede again that I have no clue of what her mission really is but then that is, again, beside the point for none else does. Everyone knew it once, that too not long ago. All she wanted to then was demolishing the Left, not all of it but merely the shade that ruled her home state then. She did that. Or wait; there is a strong difference of opinion on that count. Her critics say that she did not; the Left did it on its own as in it was something similar to a mass political suicide committed by them. Still, she deserves the credit for at least holding her ground if not for making it slip from beneath the legs of her enemy. As luck would have it, the other Left in her home state supported her efforts to the hilt. One of them went to the extent of declaring her as their ‘choice’ of (the then) next Chief Minister of West Bengal. The woman on a mission paid back by bumping him off the face of mother earth. How brutally, is beside the point. Thereon, she started on a mission of banning everything that went even a thousandth shade close to Red! From banning Marx from books and warning his party members from having any relations with the members of the Left to banning newspapers from libraries, her decisions hinted that she was on a mission to demolish the Left, all of it now. Then she met another rustic rabble-rouser from the lands of those Indo-Gangetic barbarians I am a proud progeny of. 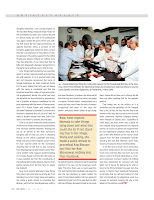 The fact that Netaji, Mulayam Singh Yadav for the uninitiated, has been very close to the Left for almost ninety percent of his political life was, again, beside the point. There was nothing that bound the two regional Chatraps. As against Mamta being a product of the Congress juggernaut, Netaji has been a proud inheritor and champion of the politics of anti-Congressism. 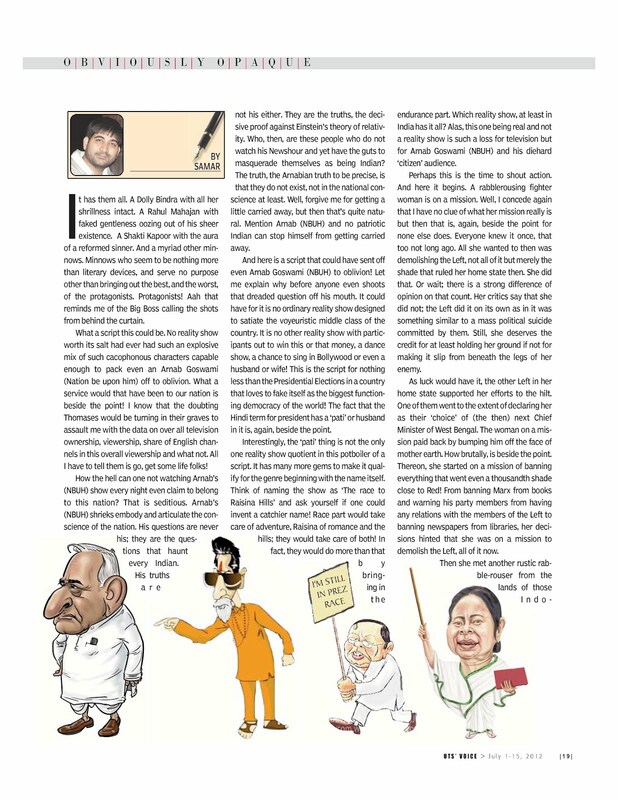 His party’s support of the United Progressive Alliance reflects on nothing more than the absurdity of our times that find his bête-noir Mayawati’s Bahujan Samaj Party in the same camp without even a hint of irony. Only thing that bonded the two was their quest to remain relevant in Delhi and that they did with aplomb. Or so it seemed when Didi, and not Congress announced the name of Pranab Mukharjee as UPA’s preferred choice for the post. Stating that Didi was not happy with the name is immaterial and that she breached unwritten codes of high-level political engagements beside the point! And then she did what she does the best by presenting a list of possible consensus candidates for the post beginning with the name of former president A.P.J. Abdul Kalam and ending with Somnath Chaterjee’s! Somnath? Is she not on a mission to demolish the Left, all of it? Well, no need to trouble oneself over that. Didi’s mission is not known to anyone, she included. That is the point where the reality became more like the reality shows playing themselves over all those satellite channels. 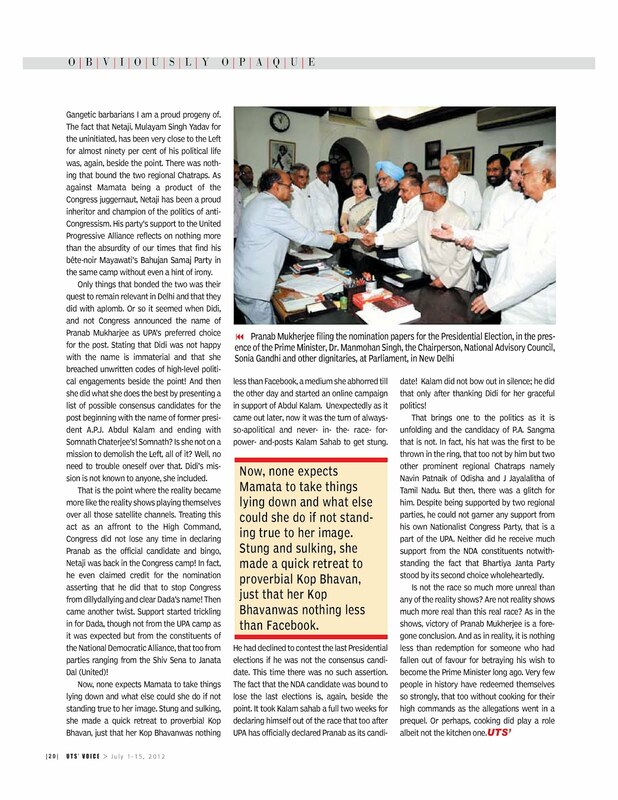 Treating this act as an affront to the High Command, Congress did not lose any time in declaring Pranab as the official candidate and bingo, Netaji was back in the Congress camp! In fact, he even claimed credit for the nomination asserting that he did that to stop Congress from dillydallying and clear Dada’s name! Then came another twist. Support started trickling in for Dada, though not from the UPA camp as it was expected but from the constituents of the National Democratic Alliance, that too from parties ranging from the Shiv Sena to Janata Dal (United)! Now, none expects Mamta to take things lying down and what else could she do if not standing true to her image. Stung and sulking, she made a quick retreat to proverbial Kop Bhavan, just that her Kop Bhavanwas nothing less than Facebook, a medium she abhorred till the other day and started an online campaign in support of Abdul Kalam. Unexpectedly as it came out later, now it was the turn of always-so-apolitical and never- in- the- race- for-power- and-posts Kalam Sahab to get stung. He had declined to contest the last Presidential elections if he was not the consensus candidate. This time there was no such assertion. The fact that the NDA candidate was bound to lose the last elections is, again, beside the point. It took Kalam sahab a full two weeks for declaring himself out of the race that too after UPA has officially declared Pranab as its candidate! Kalam did not bow out in silence; he did that only after thanking Didi for her graceful politics! That brings one to the politics as it is unfolding and the candidacy of P.A. Sangma that is not. In fact, his hat was the first to be thrown in the ring, that too not by him but two other prominent regional Chatraps namely Navin Patnaik of Odisha and J Jayalalitha of Tamilnadu. But then, there was a glitch for him. Despite being supported by two regional parties, he could not garner any support from his own Nationalist Congress Party, that is a part of the UPA. Neither did he receive much support from the NDA constituents notwithstanding the fact that Bhartiya Janta Party stood by its second choice wholeheartedly. Is not the race so much more unreal than any of the reality shows? Are not reality shows much more real than this real race? 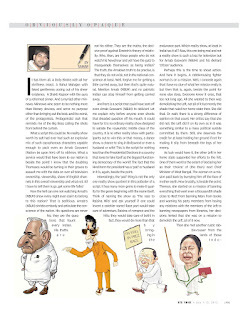 As in the shows, victory of Pranab Mukherjee is a foregone conclusion. And as in reality, it is nothing less than redemption for someone who had fallen out of favour for betraying his wish to become the Prime Minister long ago. Very few people in history have redeemed themselves so strongly, that too without cooking for their high commands as the allegations went in a prequel. Or perhaps, cooking did play a role albeit not the kitchen one.